What’s the Deal: Fairmont Hotels in Bermuda is offering a way to extend summer with the Endless Summer Package. Endless Summer Package, guests have the opportunity to stay a third night free. This offer is available at both The Fairmont Southampton and The Fairmont Hamilton Princess. Backstory: Located only two hours from the East Coast, Bermuda is the perfect long weekend getaway. Enjoy playing in the surf and an invigorating game of golf, followed by an afternoon at the Willow Stream Spa and sunset cocktails at Dock at the Waterlot at The Fairmont Southampton. It offers great beach views and eight restaurants. Meanwhile, from traditional afternoon tea to relaxing by the pool to exploring the city of Hamilton, The Fairmont Hamilton Princess provides the quintessential Bermuda experience. With access to the services and amenities at each hotel, guests can stay at one and play at both. Complimentary ferry service between the two properties creates the perfect city and resort experience. Fine Print: This offer applies to stays through November 30, 2013. 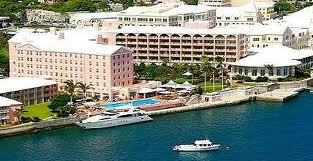 Rates start at $279 per night at The Fairmont Southampton and from $349 at The Fairmont Hamilton Princess. The Endless Summer Package is based upon availability and exclusive of tax, gratuity and resort levy. Booking: Call 1-800-441-1414 or visit www.fairmont.com.